Winter is upon us and it’s smart to be thoroughly prepared when it comes to you vehicle. There are some auto maintenance jobs and safety checks that are specific to cold air and winter driving. Antifreeze is an essential part of your car’s winter protection. Your car contains a 50/50 mix of water and antifreeze. Make sure the level is full and the mixture is close to 50/50. Many auto service stations and repair centers will check this mixture for free, or you can buy a tester for around $5.00. The other primary function of antifreeze is to keep your cooling system from rusting. The rust inhibitors in antifreeze break down over time and need to be renewed. In areas like ours that see snowfall in the winter, you are also driving through some messy stuff left on the roadway – particularly after the highway department has scraped the road and deposited material to aid traction. This includes a lot of sand and salt, both of which end up on your windshield. Basic advice, but an essential part of winter driving! In bad weather, and especially when there is slush and other material on the road, you need to make sure your windshield washer reservoir is full. On a snowy or messy day, you can easily go through half a gallon or more of windshield washer fluid trying to keep your windshield clear. It’s a good idea to keep some extra fluid in the trunk in case you run out. And make sure you get the good stuff – stay away from the already-half-frozen stuff outside your local gas station! Some of these cheap fluids freeze around zero degrees. Tire pressure drops by about one pound per ten degrees of temperature. So, if it’s minus 10º now, and the last time you checked your tire pressure was back during that sweltering heat wave in July, your tires will be dangerously low and will jeopardize your car’s handling. Winter driving demands an alert driver. Before starting your trip, brush the snow off your vehicle. Remove ice and snow from all glass surfaces and make sure snow has been removed from headlights and tail lights. Other motorists need to be able to see you. Make sure you adjust your driving speed and distances between other vehicles. Even if you and your car are thoroughly prepared, there is always the possibility of an accident. 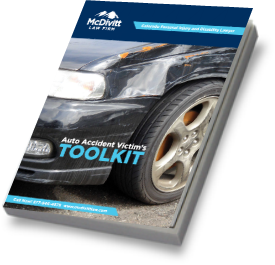 If you have been injured in an accident, contact one of the experienced Colorado auto accident attorneys at McDivitt Law Firm’s. Call toll free (877) 846-4878, or click here to fill out a free case evaluation form. Remember, your initial consultation is absolutely free, and you do not owe us a fee until we collect money for you.